13:56. Manson powerbombed Octagoncito for the win. 11:20. Moonsault sideslam from Fenix to Apache for the win. Argenis replaced Atomic Boy. 18:20. Zorro replaced Elegido. Inferno Rockers were the unlisted wrestlers. Machine pinned Drago with a German suplex. 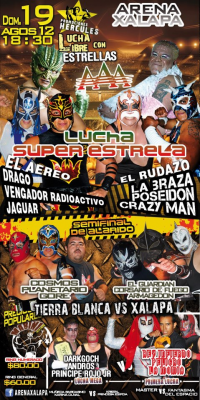 5) Joe Lider, LA Park, Psycho Clown b Psicosis, Silver King, Texano Jr.
22:37. Earlier in the night, LA Park forgave Joaquin for costing him Dorian's head shaving, but promised Dorian will learn his actions has some consquences. Silver King replaced Octagon, who did appear but said he was injured. Psicosis jumped out of the crowd to attack Park. Park and Psycho Clown had issues during the match, but the tecnicos still won. 16:47. Perros turned on Garza and destroyed him prior to the match. Halloween tried to replace Garza in the match, but the ref didn't allow it and called a DQ. 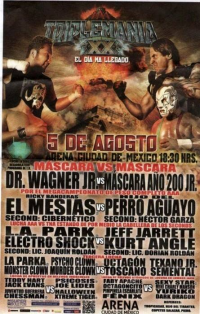 Protector, looking much improved, replaced Principe Rojo Jr.
After the previous match, Dorian & Konnan revealed Vampiro's new AAA contract allowed Dorian & Konnan to put him in matches whenever they wanted and Vampiro must wrestle in them or he'd be kicked out of AAA. Chessman won in seconds. tournament in honor of Dinamico I & II. Structure is unknown. Tecnicso took 2/3. Perro fouled Mesias in the third. Wagners took 2/3. Silver King turned on his brother in the third fall for the DQ. Muneca Sarcrmo & Karin Duval missed due to injury and illness. Principe fouled Bucanero as Infierno did the same on Andros. Rudos unmasked tecnicos for the DQ. Jennifer Blake replaced Sexi Star. 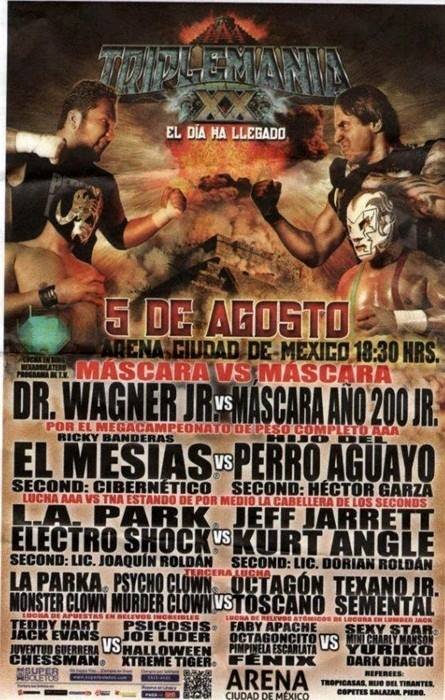 3) Monster Clown, Murder Clown, Psycho Clown vs Halloween, Nicho el Millionario, Texano Jr.